Like seams of a baseball, tectonic plates wrap around Earth. 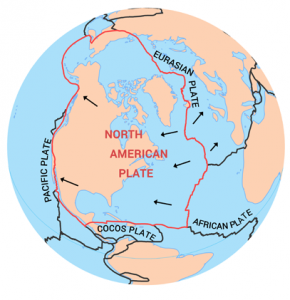 The 2nd largest plate on Earth is the North American Plate. Each plate moves deceptively slow. For example, the North American shifts just centimeters every year. Earth’s tectonic plate boundaries are strange because they often contain both continental and oceanic crust. For example, the North American major plate not only contains the continent of North America but also part of the Atlantic Ocean. The North American plate extends all the way over the North pole and even contains Siberia and the northern island of Japan. It also includes Greenland, Cuba and the Bahamas. The east-side of the North American Plate straddles the Eurasian Plate and African Plate. This is the Mid-Atlantic Ridge where divergent tectonic plates pull apart from each other. In turn, we find some of the youngest geologic rocks at this mid-oceanic ridges. The Farallon Plate was an ancient oceanic plate which sunk down subducting below California. In Oregon and Washington, there’s still a small piece of it that exists which is now called the Juan de Fuca plate. 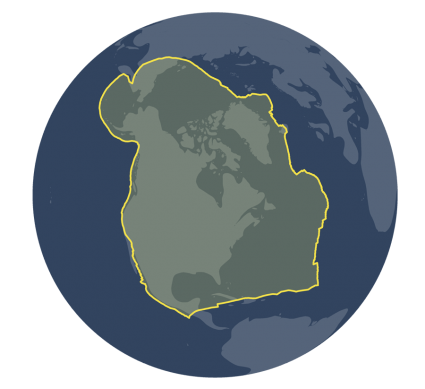 During the time of Pangaea, the Farallon plate was largely responsible for pulling North America westward away from Europe and Africa. The interior of the North American plate contains a giant granitic craton. It’s believed that the North American (Laurentian) craton is 4 billion years old. The total size of this plate is 75,900,000 km2 making it the second largest of the 7 major tectonic boundaries on Earth. If you live in Canada, United States or Mexico, you’d most likely be situated on the North American major plate. But what are some of the other major plates in the world? 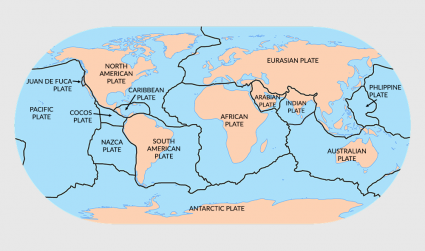 Read some of the articles below to familiarize with the geography of plate tectonics.